The victims included religious delegates from various parts of the country, invited by the Afghan Ulema Council to celebrate the birth anniversary of Prophet Mohammad on Tuesday. Without knowing who was behind the attack, it was unclear whether the aim was simply to undermine President Ashraf Ghani’s government, or whether it was part of a strategy to keep the pressure on his government and its Western allies while they pursued talks with the Taliban, to end the 17-year long war. “As of now we don’t know which militant outfit could be behind the attack. Investigations are at a preliminary stage,” said a senior security official who was at the blast site on Wednesday morning to collect forensic evidence. The council, the country’s largest religious organization, brought together scholars from the Sunni sect, but it was uncertain whether the attack could have had a sectarian dimension. Though Sunni themselves, Taliban and Islamic State (IS) militants have targeted religious scholars aligned with the Afghan government in the past. This time, the Taliban quickly denied its involvement and condemned the attack on religious preachers and scholars. Khalilzad has declared a deadline of April 20, when Afghanistan’s presidential election falls due, to end the war, but the country’s security situation has worsened since NATO formally ended combat operations in 2014. During recent days, U.S. President Donald Trump has angered neighboring Pakistan, which Afghan intelligence and Western military leaders have long suspected of giving succor to the Taliban. The toll from Tuesday’s attack could easily rise as most of the 80 wounded suffered severe injuries, hospital and government officials said early Wednesday, giving the latest casualty figures. 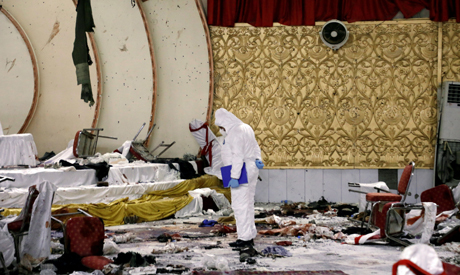 Investigators said the bomber had sneaked into a banquet hall on the first floor of a large building close to the Kabul airport, where some 200 people were gathered. The explosion left body parts strewn all over the carpeted floor and copies of the Quran, the Muslim holy book, were scattered around burnt furniture. “I was reciting verses from the Quran near the gate of the crowded banquet room when a loud explosion occurred. It was like a volcano,” said Syed Usman, a Muslim scholar who had traveled from the outskirts of Kabul to attend. Doctors at government and private hospitals in Kabul struggled to assist the badly wounded victims, many burned beyond recognition. “The situation is really horrendous,” said Mohammad Qaseem, a surgeon at the Kabul hospital.